Once again I had a zucchini from the csa to use up and a dessert to bake. This was pretty yummy although it was a bit dry for my liking. Doesn’t streusel usually have butter in it?? Heat oven to 350°F. In a large bowl, beat zucchini, sour cream, sugar, egg whites, egg, oil, and vanilla extract until well blended. Combine the flour, baking powder, baking soda, and salt in a medium bowl; gradually beat into zucchini mixture until blended. For streusel, combine brown sugar, walnuts, raisins, and cinnamon; set aside. 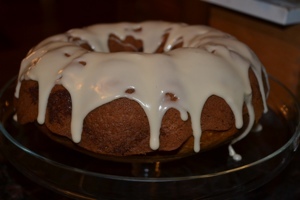 grease a 10-inch bundt pan. Add a third of the zucchini batter to the pan. Sprinkle half of the streusel mixture over the batter. Top with another third of the batter and sprinkle with remaining streusel mixture. Top with remaining batter. Bake 55 to 65 minutes or until toothpick inserted near center comes out clean. Cool 10 minutes and remove from pan to wire rack to cool completely. In a small bowl, combine powdered sugar, vanilla extract, and enough milk to achieve desired consistency. Drizzle over cake. Luckily, I am home for 3 weeks before I have to travel again but the same can’t be said for Townie. Lucky lady is off to Puerto Rico! Jealous!!! So, you get a post today. MAYBE one later this week and then not again until she gets back because what’s the point in having a partner to compare dinner and desserts with if the partner isn’t around to compare dinner and desserts with?!?! Like many of my cakes, because obviously I have been lacking in the TIME department of late, this is not a from scratch cake. It is Duncan Hines WHITE cake mix. I made it with olive oil, added 1 T of pure vanilla extract and zested an orange into the batter to give it a fresh taste. 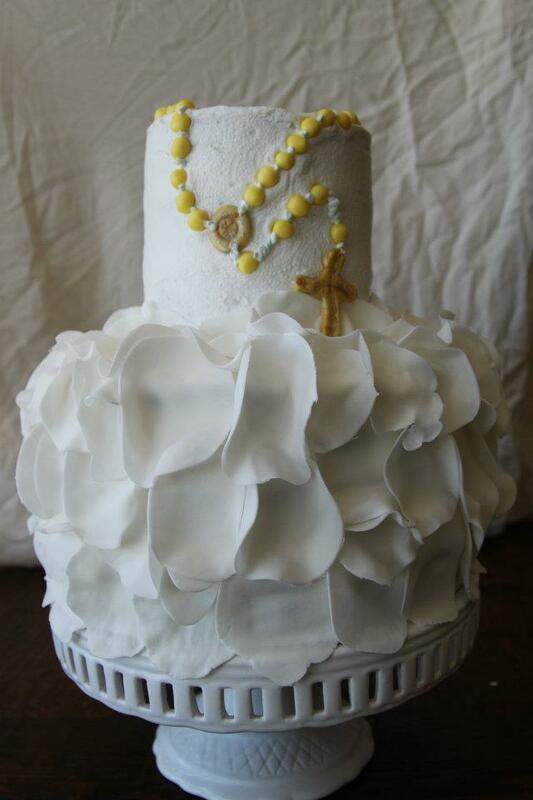 The filling is purchased from Cake Crafts in Englewood, Colorado. They are just around the corner from the first house my hubby and I purchased. This batch my friend brought to me after she went on a trip over the mountain (a 4 hour drive for us now) but you can order online and they will ship with a minimum purchase. They have a wonderful selection of filling flavors, this being raspberry, and their coconut is AWESOME! Bake cake according to directions, fill with filling, ice with basic buttercream and decorate with fondant. My friend’s daughter wanted bright colors so I, once again, opted for Duff’s because his colors are very bold. This week has been an utter disaster! I sat down to post my cake and was thereafter informed my middle child had lost her math book. Commence tearing apart the house and both vehicles, only to NOT find said math book! Wednesday night was Girl Scout prep night. All the incentives arrived from Girl Scout cookie sales AND the 600 patches I ordered 2 months ago also arrived. I spent HOURS sorting stuff into bags so we can distribute today. It is year end planning time at work, quarter end AND I have both sets of grandparents visiting. So, cake didn’t get posted! This is the cake I made for my math-book-losing child’s First Communion. There is nothing special about this cake. The top is a golden white cake mix, into which I surprisingly did not at add anything special! 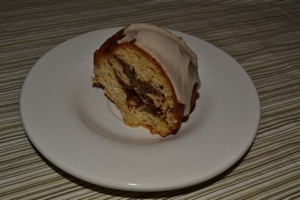 It is filled and covered with basic buttercream. The bottom is choc cake, chocolate filling, vanilla cake, vanilla filling and choc cake, layered. As mentioned in a past post, I make my chocolate cake with cold coffee instead of water. 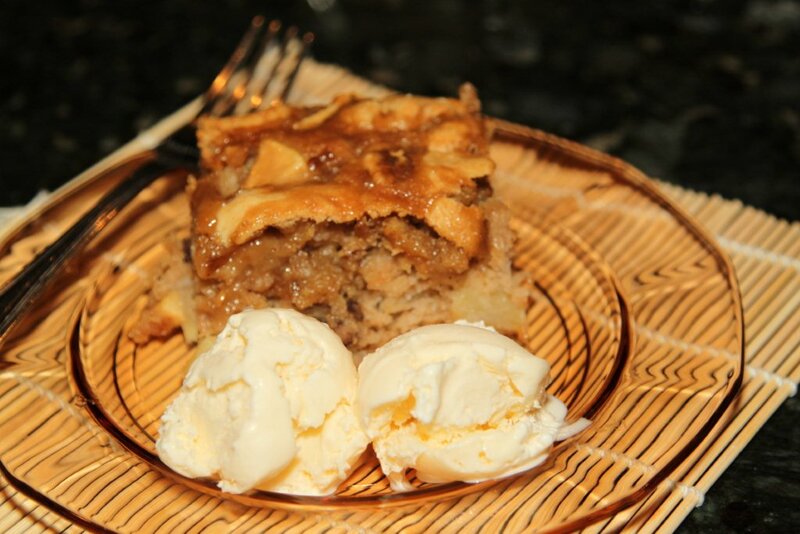 The fillings in this case are pudding made with 1/2c less milk than required for the PIE filling recipe. The pattern on the buttercream on the top layer is made by lightly pressing a papertowel against the icing after it has crusted over. 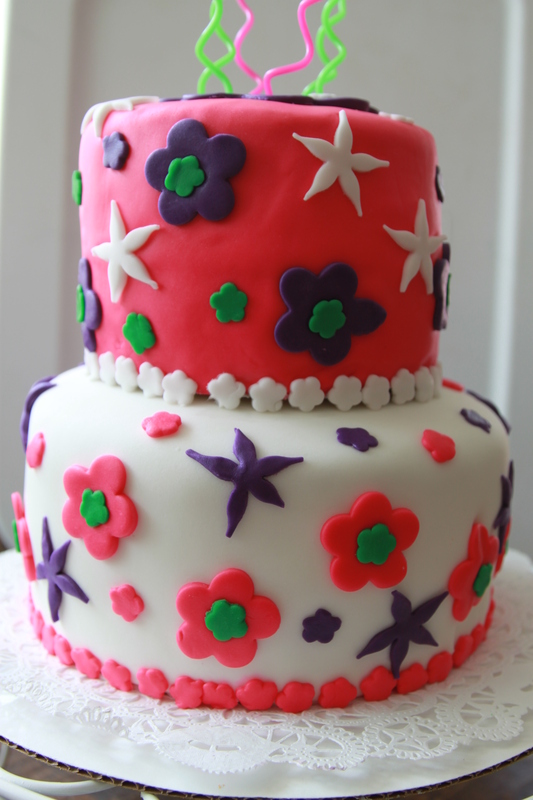 The bottom tier is circles of fondant, rolled out thin, into assymetrical “petals”. Rosary is yellow died fondant. The gold pieces were made by mixing gold powder with vanilla and painted on. I have done this with silver also…it turns out pretty. I bought a huge bag of Fuji apples at Sams Club this weekend. It was way more apples (HUGE apples) then my family could eat before they go bad. So, I went on the hunt for an apple recipe. I found this recipe. It looked easy enough and I had all the ingredients. It came together easily. Unfortunately, it only took 2 of the apples, I had peeled 4! I don’t think I liked this too much. But, I can’t quite put my finger on why. The kids and hubby all liked it. *The dough for this is VERY sticky. In a medium bowl, combine the flour, sugar, baking soda, salt and pumpkin pie spice.Stir with a whisk to mix everything together. In a large bowl, mix the eggs with a hand mixer til light in color and foamy. Add the oil, vanilla and almond extract and beat well. 1. Preheat oven to 350 F. spray an 8 x 8 inch pan with baking spray. 2. Make the base first: mix together cake mix, butter and 1 egg. 3. Pat into pan, create an even layer. 4. Make the ooey gooey layer: Cream together the cream cheese, 2 eggs, sugar and vanilla. 5. Pour gooey layer over cake layer, spread to edges. 6. Bake for 45 minutes or until edges are golden brown, center should be a creamy yet solid consistency like cheesecake or heaven. 7. Cool completely in pan before cutting with a clean, dry knife. Way too much personal stuff to go into right now, but know I had every intention of being on time with “Baking Tuesday” and the stars were, once again, just not aligned! Anyway, moving on to more chipper discussion! Our middle child turned 8 this weekend. Holy cow does time fly! She is our animal lover. I think this week was the FIRST time, and I mean EVER, she checked a book out from the library that was NOT about animals. Needless to say, come birthday time, we typically have a living creature of some kind to design. This year was no different. The cat on a huge ball of yarn…hard to not smile! This was Duncan Hines Moist Deluxe French Vanilla cake. 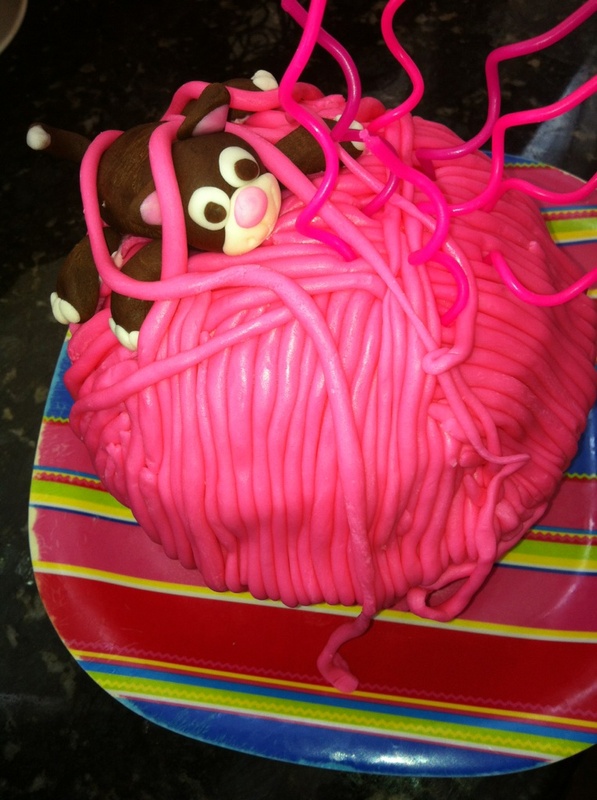 Which, to be honest, I love but do NOT suggest if you are attempting to make a ball cake of any kind. It is TOO moist, if there is such a thing. For a ball design, I will use a pound cake next time. 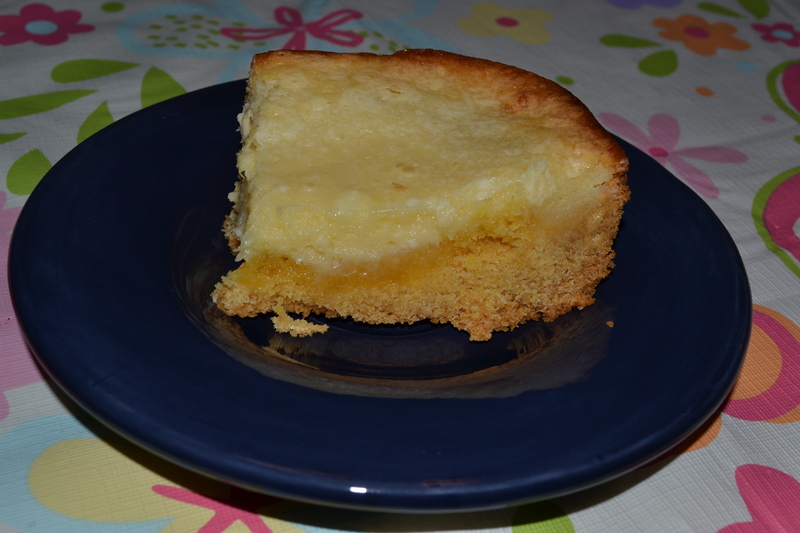 The shape is not very forgiving so a more dense cake is needed. The bottom portion of this particular cake is reinforced in ways I just don’t even want to mention! Anyway, I made the cake mix by following the recipe on the box. I used olive oil, as usual and decreased the water by 1/3 cup. In its place I used Cointreau (but Grand Marnier would be just as effective), because the slight orange-y flavor is nice with the strawberries. I chopped some fresh strawberries really fine, almost to mush, and added 1/2c to the cake batter. Bake as directed on the box (or, in my case, longer because of the high altitude). I used cream cheese frosting with some strawberry “mush” added, which I didn’t actually measure because I was just using up what was left from what I prepped to put in the cake. Cover in fondant. This is Duff’s. So, I had the photo and everything ready to go on Tuesday. However, I got sucked into the last half of the 3rd Hunger Games book and couldn’t put it down. (By the way, I read all 3 books between Saturday and Tuesday…needless to say, I was a bit more obsessed with finishing the book than posting a cake!) When I finally finished reading it, at 11pm, I was too tired to post. Then yesterday I was working on a Girl Scout project that needed done before today so by the time that was done, at 11pm, I was too tired to post. So, here it is today! This cake is literally just a boxed fudge cake mix, I think I used Duncan Hines. I don’t have a preference for cake mixes, I just buy what is on sale, because I am going to modify them all anyway. I followed the box recipe but rather than use water I used a pot of coffee. I added some vanilla extract, too. And, as always, I use olive oil with my cake mixes. For the filling I just used Jell-O Chocolate Pudding mix, on the “pie filling” recipe, but decreased the milk by an additional 1/2c (it was the family sized box, the bigger one), so only used 2c of milk. I added a few splashes of almond extract and started building the cake. The butter cream is, once again, Wilton’s. The embellishments are Twizzler’s Cherry Pull N Peel and Mike N Ikes (just the red ones, on the rocket itself….Hot Tamales would work too). A few cake cones and away we go! 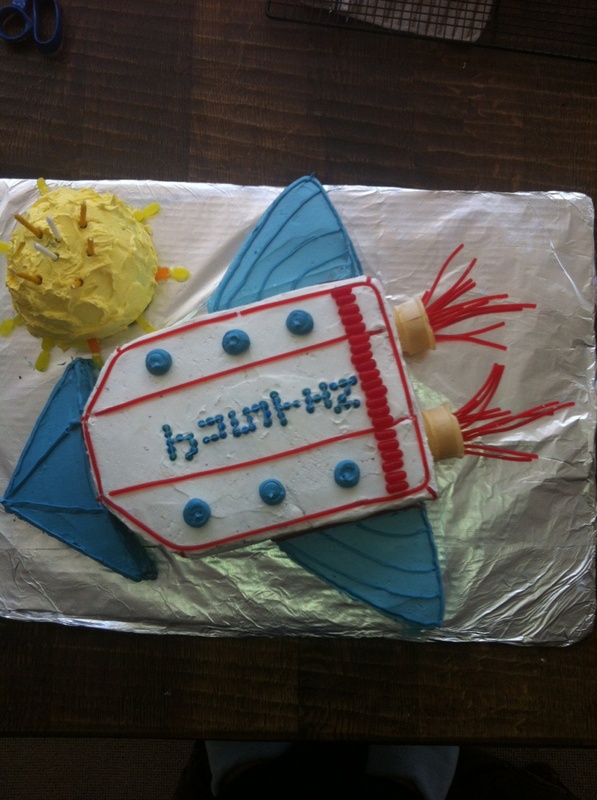 I made this cake for a friend’s son’s 7th birthday.